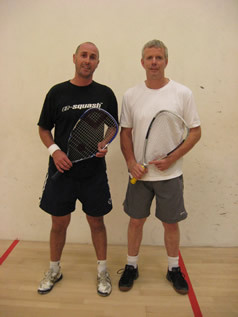 The 2nd Chi Open Racketball tournament took place on Saturday 14th August At Chichester R&FC and held A,B and C events. All players were to play 3 matches throughout the day all to be the best of 5 games. In the A event the field boasted players holding 2 Current National titles, Mike Phillips O50, Ian Graham O60, two National runners up, Matt Baker O35, Steve Wall O45, and a National doubles title Matt Baker senior mens, and a selection of Nationally ranked players. The 1st round got underway with Matt Hansford of Chichester taking the 1st game off no 1 seed Matt Baker before Bakers fitness and all court play saw him through in 4 games. No 2 seed Christian Turner desposed of Ian Graham in straight games, Steve Wall had a tough 4 game win over Hampshires Dave Moore and Englands no 12 Gavin Perrett dropped the 1st game to Mike Phillips then narrowly winning the 2nd before going on to clinch victory 5/11 11/9 11/6 11/5. In the B grade top seeds both Chichester players Andy Henshaw and 15 year old Miles Jenkins progressed to the final Henshaw with victories over Richard Aklam of Brighton and Chichesters Fraser Poole, while Jenkins defeated Chichesters Tommy Strudwick and Jamie Allday. The C event saw defending champion Tim Baker progress through at the expense of Harry Henshaw of Chichester, then a massive game with the host clubs Chris Earl, Baker winning 14/12 in the 5th. In the bottom half Chichesters Lee Strange defeated Devon opponents Ray Hoopert and then a tough 5 setter with Karen Beeley to set up a final with Baker. 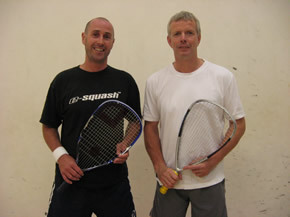 The C final saw defending champion Tim Baker win a great match against the fast improving and flamboyant Lee Strange 3 – 1. The A event semi finals saw Christian Turner withdraw feeling unwell giving Steve Wall a welcome passage through to the final. The 2nd semi final was a classic and undoubtedly match of the Championships. Gavin Perrett bought his A game to the court and battled courageously for 80 mins, Matt Baker rose to the challenge although giving away 10 years kept digging in, they shared the first 4 games before Bakers mental resolve shone through taking him exhausted in to the final. The question now was could Baker recover in 90 mins to take on a fresh Steve Wall who was giving away 14 years to his exhausted opponent. The answer YES, Baker dominated throughout the 11/9 12/10 11/6 victory although the first 2 games were close Baker looked so comfortable out of the back of the court and was still quick enough to cover anything Wall had in the front. Last years runner up was now this years A grade champion. Congratulations to Matt Baker, Miles Jenkins and Tim Baker for winning their respective grades in what was a thoroughly enjoyable day of Racketball, and many thanks must go to England squash and racketball for helping sponsor the event, a big thanks to Chichester Racquets & fitness club for providing the facilities and finally a special mention must go to 13 year old Toby Henshaw who all day made himself available to mark matches, the Chi Open lives on so look out for entry forms for next year.